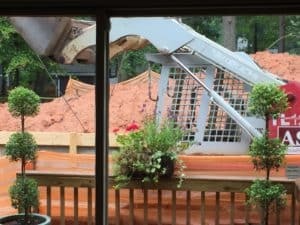 Document any damage to your property with dates and photos – for instance, the silt fence wasn’t doing its job and with all the rain we’ve had, we had a river of red clay running through our back yard and down our driveway. They repaired the fence and are pressure washing our walk and driveway. It provides a great source of contractors if you need work done at your house – for instance, we are getting a new deck put on and we got a quote from their framers. At the end of the day, keep in mind that the new house will increase your property value and you may gain some great neighbors! And if you are looking for your own new construction, or even a new neighborhood to call home, give The Peters Company a call!